I used to think also that bitterness and sourness doesn't go well together but thinking in the way he describes it makes more sense, the bitterness will fade and the sourness and funk will appear. I'd like to try that. I use a lot of T58 blended with Belle Saison in a 1:1 ratio, it works very well for me and the flavor profile I want, I start a 21°C and let it raise 'till 28°C and attenuates extremely well. Thanks for your post, Amos! 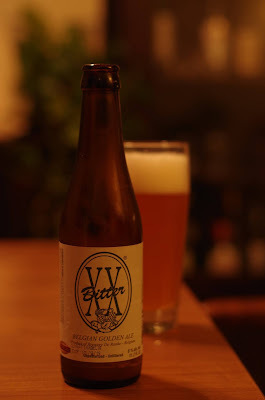 Strangly enough, I also found that a mix of T58 and Belle Saison was quite good. The T58 always gave out loads of esters, probably too much, but it was pretty much perfect after a few months. I actually have a fair few Brewers Gold in the freezer and think I would substitue the Hall. Mitt. with something similar.... Thanks for the inspiration Amos.Great post as ever! I like the idea of blending these two strains. My only concern would be that I've found Belle Saison to be almost too attenuative, like Wyeast 3711. It's always taken beers down below 1.000 when I've used it in the past. But I have packets of both in my fridge, so I'll have to try after the summer. After trying a pretty fresh bottle tonight, I think T-58 came pretty close to the yeast character of the original, attenuation aside. But I didn't even approximate the quality and level of bitterness. I made one with BR-134, really liked it, but surprised it stopped at 1012. How did the roselare-one turn out?